With all his talent, Keach could surely unleash a Falstaff that would not only rival the most interesting man in the world but drink him under the table with either sack or Dos Equis beer—a kind of Falstaff so fascinating that the Prince of Wales would risk his place in the king's council to be around him. Shakespeare Theater Company, Sidney Harman Hall, Washington, D.C.
Edward Gero as King Henry IV in the Shakespeare Theatre Company production of Henry IV, Part 1. Photo by Scott Suchman, Shakespeare Theatre Company. William Shakespeare's history plays, except for Richard III, make for notoriously difficult box office receipts because audiences believe them to be, well, history plays: boring chronicles of a far-gone time. Shakespeare was writing about the very real War of the Roses and the noble class's political wrangling over England's throne, which was still casting its long shadow over the nation in his own time, much as our own Civil War does for our time. But you know what? Game of Thrones has made medieval warfare cool, though that is fantasy; House of Cards has made political skullduggery cool, though that is—well, kind of fiction. And if you let him, Shakespeare makes both cool in all his history plays—all— but especially Henry IV, Part One. It introduced to the world what is universally regarded as the greatest comic character of all time, Falstaff. Its plot is centered on the generation gap conflict between a father and son. It has a guy named Hotspur who lives up to his name, it has a deluded warrior poet, it has pranks played on highway robbers, and half of this play about noble families fighting over the crown is set in a tavern. Henry IV, Part One, is a personality-driven comedy and a personality-driven drama all in one. Unfortunately, Michael Kahn's Shakespeare Theatre Company production of Henry IV, Part One, at Sidney Harman Hall in Washington, D.C., with Stacy Keach in the role of Falstaff, is just the kind of approach to the history plays that bolsters their reputation as boring: an unengaging passage of past times—old England, old Shakespeare, old theater. The portion of this production presented as personality-driven drama—the troubled relationship between Hotspur and his wife—is an extra-textual imposition wielded like Thor's hammer. Meanwhile Shakespeare's ingenious handling of Prince Hal's relationships with his father and surrogate father and his depiction of King Henry's clever craftsmanship in managing his kingdom are muddled by a general lack of clarity that gnaws at this staging. Before I go any further, I must disclose an important caveat concerning my assessment of this performance with its unfocused portrayals, rote delivery of Shakespeare's verses, less-than-sharp combat sequences, and the absence of chemistry among the actors (we also had trouble simply hearing some of the actors, but that might be the Harman's uneven acoustics). The performance we saw was six days before Opening Night, even though we saw the performance as part of our full-price season subscription package. So it's possible the performances we witnessed might improve upon and after Opening Night. Costume designer Ann Hould-Ward dresses the cast in fantastically styled medieval clothes, almost graphic novel in concept, and Alexander Dodge's set is a floor-to-ceiling aged-wood wall with a huge outline of England engraved on it and a metal circular stairway to one side. The giant wall separates to reveal tall grass hills in silhouette for the Gad's Hill and battlefield scenes. However, the production has an old-fashioned feel to it, especially with Keach's Falstaff. With his makeup I couldn't help feeling I was watching Ralph Richardson in the role from the middle of the last century, a Falstaff who is pretty much lovable and kind of comical. A safe Falstaff, with no hint of danger about him and not enough evidence of the kind of decadence that should worry Prince Hal's father. Falstaff's famous soliloquies Keach delivers as meditations that we might be eavesdropping on rather than direct eye-to-eye addresses to the audience, which I regard as missed opportunities. Recent Falstaff's I've seen stick their guts in the faces of patrons and engage in give-and-take catechisms with us, their ultimate audience—Falstaff: "Can honor set to a leg?" Audience: "No." Falstaff: "Or an arm?" Audience: "No"—dangerously hilarious characters for whom we are willing to throw caution to the wind. With all his talent, Keach could surely unleash a Falstaff that would not only rival the most interesting man in the world but drink him under the table with either sack or Dos Equis beer—a kind of Falstaff so fascinating that the Prince of Wales would risk his place in the king's council to be around him. Matthew Amendt plays that Prince of Wales as torn between loving and loathing the old fat knight. His entire portrayal comes off as a young man passing through life without any bearings. Not a calculating politician (like his real father King Henry), not a smirking cynic (like his surrogate father Falstaff), Amendt turns his "I know you all" soliloquy into sudden self-realization. "Yet herein will I imitate the sun, who doth permit the base contagious clouds to smother up his beauty from the world, that when he please again to be himself, being wanted, he may be more wondered at!!! by breaking through the foul and ugly mists of vapors that did seem to strangle him." That "more wondered at" he exclaims in astonished surprise as if it were a Good-God-I'm-Brilliant thought, and the rest of this speech follows that tone. The reading may be apt, but the fervor of Hal's self-astonishment makes him seem vacuous, and it's an impression he can't shake as the play progresses, undermining his otherwise heartfelt moment of atonement with his father. At the climax of the Eastcheap play-acting scene, both Keach and Amendt play their characters' emotions on their sleeves. Amendt's Hal grows increasingly serious and downright threatening as he plays his father describing Falstaff; Keach's Falstaff grows noticeably fearful at the prince's promise to banish him eventually. It is dramatic, perhaps overly so because it doesn't quite fit in with a Falstaff who is either a mischievous con or oblivious mooch, though we can't be sure which this Falstaff is. That's because subtlety is not an attribute of Kahn's overall direction. This becomes a glaring issue in the portrayals of Hotspur (John Keabler) and Lady Percy (Kelley Curran). No criticism of either's acting skills. Keabler is an endearing Harry Percy, his sense of honor being his drug of choice, supercharging him into hyperactivity like a line of cocaine. Curran is a spirited Lady Percy, a psychological match for her manchild of a husband and most intuitive, too. Their first scene together, however, is less a toying dialogue between kindred spirits and more of a marriage counseling session in which the couple explore the depths of his love. To make sure you get the point, in the Welsh scene, Mortimer (Aaron Gaines) and Lady Mortimer (Vanessa Sterling) are all over each other, kissing like two horny teenagers getting a moment alone behind the school gym while across the stage, the two Percys watch the couple with much discomfort. Maybe they're thinking the Mortimers should get a room, but I'm sure they are wondering what happened to the passion in their own marriage. At the end of the scene, as misunderstanding upon misunderstanding builds in their dialogue over Lady Mortimer's song, Hotspur storms off in a huff on the line—delivered to his wife in this telling—"I'll away within these two hours, and so, come in when ye will." Lady Percy is left alone on stage, until Hotspur returns and literally sweeps her off her feet. Awwww, he really does love her! Another sledgehammer moment comes right before the intermission, when Hal is left alone and Hotspur suddenly appears at the back of the stage. They look at each other as the soundtrack intones a dund-dun-DUNNNNN mood. Yet, some of the play's more interesting character depictions are excised or altered. Hal's prank on the tapster Francis is dropped—no great loss, in my opinion—but also cut out is Hal's mimicking of Hotspur's conversation with his wife. Vernon's description to Hotspur of Hal vaulting onto his horse remains, but his later account of the manner in which Hal issued his challenge of single combat with Hotspur is cut. As Shakespeare writes it, this is the real dund-dun-DUNNNN moment for Hotspur, and his casual dismissal of his deadly foe is the last-nail evidence of his poor judgment not only in war and politics but, ironically, in matters of honor, too. 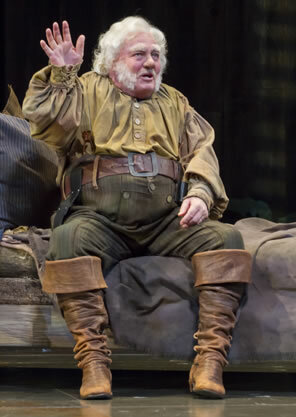 Stacy Keach as Falstaff in STC's Henry IV, Part 1. Photo by Scott Suchman, Shakespeare Theatre Company. Kahn also shuffles around some lines, most notably in the opening scene. Instead of Henry IV (Edward Gero) giving the account of the battle of Holmedon as Shakespeare has him do, Sir Water Blount, the messenger who brings the news, handles the speech. There's logic in Kahn's decision as, on the surface, it seems odd that Henry, who already knows the battle's outcome, would let Westmoreland talk at length about how his news came before the battle was concluded. However, while Kahn might think he's improving on Shakespeare's narrative, the director apparently has not worked for military or political leaders who use such a device to publicly put a subordinate in his place without obviously embarrassing said subordinate. Shakespeare's Henry IV is a king very much in control of his court, if not his kingdom; nothing gets past him. 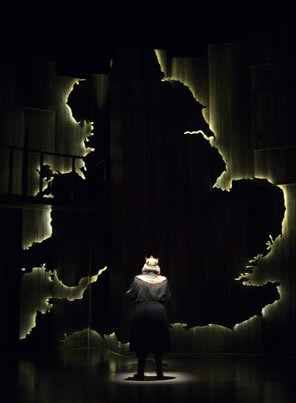 Gero's Henry, however, seems overwhelmed, especially as the play starts with him staring up at that huge outline of England, now enhanced in glowing light, while Kahn imports from Richard II a voiceover of Richard's Flint Castle speech: "Tell Bollingbroke—for yond methinks he is—that every stride he makes upon my land is dangerous treason … but ere the crown he looks for live in peace, ten thousand bloody crowns of mother's sons shall ill become the flower of England's face." One of the qualities of Henry IV, Part One, is the singularity with which Shakespeare wrote every one of the play's 33 named characters, from the super-egotistical Welsh leader Owen Glendower (here played by Ted van Griethuysen looking like a wild-haired Klingon) to the Second Carrier in the Gads Hill robbery sequence. This production offers up similar treasures, from the ever-steady Craig Wallace and the dynamic Joel David Santner as, respectively, Westmoreland and Blount, to Derrick Lee Weeden's powerfully upright Lord Chief Justice and Brad Bellamy's Bardolph, whose perfectly timed delivery of his long-thought-out lines (thinking being a difficult task for this Bardolph) garners heartier laughs than Keach's Falstaff. Steve Pickering turns in the production's most fascinating portrayal as Worcester. His very presence percolates with the kind of danger that makes Henry nervous to have him around, and his argument for fomenting rebellion Pickering delivers so convincingly that we, the audience, could easily side with him and his nephew, Harry Hotspur, against this production's Henry and his Prince Harry. Pickering's Worcester is a man with a clear head for both politics and warfare and only barely suffers fools who think they know better in either realm, whether it's Vernon (Chris Genebach) in politics, or Douglas the Scot (Rhett Henckel) and Hotspur in warfare. He barely holds in his impatience for Hotspur's antics, either at the English court or at the Welsh court, and his cynicism-dripping chastisement of his nephew in both instances is the kind of subtly-played humor layered on the serious topic of civil broils and fractured family interrelationships that makes Henry IV, Part One, one of Shakespeare's most scintillating, character-driven dramedies.